Proposed Superconducting Integrated Submm spectrometer for laboratory applications can in situ detect radiation from a coolable rf source (4-100 K) within frequency range of 200 - 700 GHz at receiver noise temperature: below 500 K (direct detection sensitivity better than 10-13 W). The Superconducting Integrated Receivers (SIR) chip is a superconducting integrated circuit comprising a quantum-noise-limited SIS mixer and a tunable Josephson local oscillator (LO). We have developed a series of lightweight and compact ultra-sensitive submm SIRs with low power consumption (typically less than 50 µW), which are beneficial for imaging applications in radio-astronomical research and remote monitoring of the Earth atmosphere. 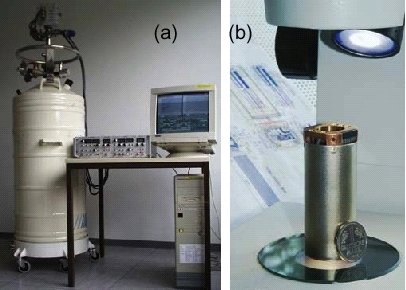 SIRs are very attractive for laboratory studies as well; the integrated receiver has been developed and tested demonstrating noise temperature below 300 K at 520 GHz. It is known that frequency stabilization of a LO is necessary for accurate detection of narrow-band submm wave emission. To realize stability better than 1 ppm of the center frequency, the LO of the SIR has to be phase-locked to an external reference source. Such phase locking of a superconducting submm FFO with continuous frequency tuning is demonstrated for the first time for ANY type of Josephson oscillator over a wide frequency range (up to 700GHz) with a resolution given by the phase noise of the reference oscillator. These results are the basis for the development of 550-650 GHz integrated receiver for the Terahertz Limb Sounder (TELIS) intended for atmosphere study and scheduled to fly on a balloon in 2006. We propose to use the achievements of the TELIS project to develop a sensitive laboratory-purpose integrated spectrometer for the detection and spectral study of radiation from a variety of superconducting oscillators. We hope that this development will be a beneficial step towards wide use of superconducting receivers in many research laboratories and universities. Prototype of the Integrated spectrometer (a). the input aperture and connectors are seen on the top (b).